1999 Strat is standard apart from the trembucker just installed in the bridge with a 500k volume pot.. 5 way selector, 1 master volume, 2 tone controls (bridge, middle/neck).. 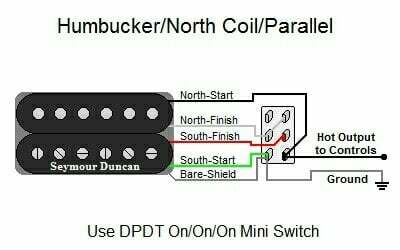 Looking to make a coil split on the bridge pup and add an option to combine it with the neck pup at the flick of a switch. Been researching this hard but haven't been able to find a diagram that covers this with a 3 way switch. Purchased the Fender Mustang/Jaguar style 3-way slider switch and think it to be a neat option for this desired setup, instead of the usual push-pull option. Thinking maybe the 3 positions would be (1) All normal, full humbucker (2) Split coil humbucker (3) Full bridge & neck together. With the 500k volume pot I have got a 470k resistor to put in the circuit for the single coils so probably have all the parts required for the build already.. The humbucker and neck combo selector is with the full humbucker and neck for the biggest possible sound I could get from the guitar, like a HH setup with both pups on.. Looking to change out the single in the neck in the near future for something like a JB Jr or lil '59 hence the interest in pairing this with the bridge. Last edited by de_dUKe; 04-26-2017 at 05:54 AM. I use a 3-way mini toggle for coil split and series/parallel. Plus a push pull for 7-way switching. Either 12 or 13 different combinations total. My bridge tone pot controls​ a Guitarheads Underdrive circuit instead of tone. Simple and discreet. A pic of what it can look like. A 7-way diagram and a series/split/ parallel. You'll want to wire the 3way off the HB first and run that lead to the push pull pot for 7way option. Not as hard as it looks. There's a diagram for South coil split at the same site if needed. Nice guitar and cool setup you have there... and thanks..
Been studying the diagrams and I'm at a loss as to how to adapt this to my desired setup. Before last week and installing the humbucker, I had never even looked inside a guitar or even wondered how it all works..!! Self confessed wiring noob here.. Thinking I'm gonna need a very specific diagram for my intended setup...or a few more weeks studying guitar circuitry theory..
Last edited by de_dUKe; 04-26-2017 at 11:16 AM. I took basic electronics class in highschool so I wouldn't have to pay someone else to do all the mods I wanted to try. Following diagrams​ is easy for me. If it's your first project I strongly recommend some research. Maybe get a friend who has done some soldering before to help. Lots of YouTube videos too. The most boring are often the most informative. Not really the response I was looking for, but then I've been trying to get a straight answer on this forum about this for a whole week.!! Two different threads and countless posts.. 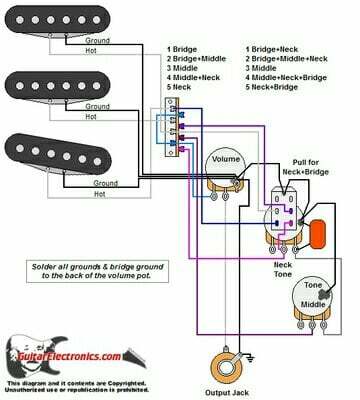 I just need someone for whom 'following diagrams is easy' to take a basic Strat diagram and add in a 3 way switch to give the two extra functions (coil split, bridge/neck combo). Take a few minutes for a experienced guitar modded I would suspect. I have studied electronics at high school too, a long time ago I may add and I fix everything myself at home (cars, tv's, iPhones etc) but advice from an expert always makes the jobs simple and painless and most forums are keen to share their knowledge. Last edited by de_dUKe; 04-27-2017 at 08:31 AM. Here is my suggestion for a wiring diagram using a 3-way blade switch as the pickup selector. There is an additional toggle switch to add the Bridge pickup to the other pickups, or alternatively add the Neck pickup into the middle position. In my diagram the bridge humbucker becomes split when it is added to the other pickups which will give a brighter Strat or Tele style sound. If you prefer to use the full humbucker in these positions, remove the Red and White wires from the toggle switch and solder the Red and White together. You can't do it... at least not with a standard 5-way switch. However, it can be done with a 5-way Super switch (like this one) in tandem with your 3-way. Again, it wasn't easy. I've been working on this diagram for almost 3 hours now in order to get it right, lay it out, and color it so it's easily readable. Good thing I enjoy a good challenge, huh? Otherwise I wouldn't have bothered to put my time in! Anyway, here's a diagram that I hope will work for you. Your 3-way switch has three basic modes that it can activate. So here it is in all its glory... let me know if you have any questions and be sure to come back and tell us how it came out for you. Oh yeah... and welcome to the forum! Well you wait all week and two come along at once..!! ..but in all seriousness, thanks you so much for your efforts Teleplayer and Briguy1968.. i really REALLY appreciate all the effort you guys have gone to on this..
May I apologise for my slightly salty post previously.. I guess my impatience and inexperience on this subject got the better of me there.. i have helped countless people on forums similar to this one in my fields of expertise, so if you ever wanna know anything about GTA 5 or vaping marijuana you guys let me know.!! BriGuy1968 you have gone above and beyond my expectations and specifications on this design.. This will make a incredibly versatile guitar setup that I will be thrilled to work on and create.. Thanks alot..
Just ordered the genuine Fender 5 Way Switch and will be eagerly but patiently waiting for its arrival and will begin work on this at the earliest opportunity.. I will be sure to post my results for anyone else interested in this really cool setup..
With many thanks and humble appreciation.. Cheers..
Last edited by de_dUKe; 04-28-2017 at 05:46 AM. 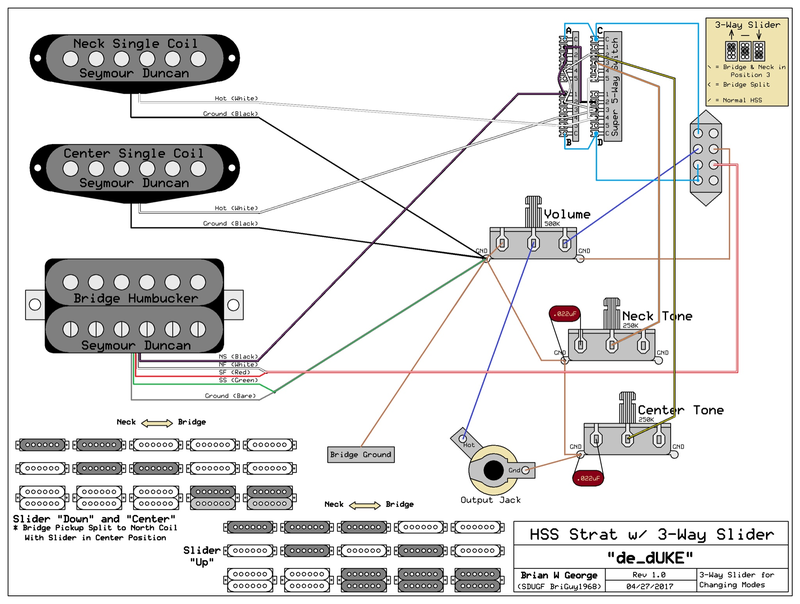 Guitarelectronics.com charges $38 for custom diagrams like that. BriGuy1968, you rock! Yes, that was an ace diagram, that I can't even begin to wrap my head around how you came up with it. I knew it couldn't be done with a simple switch. I guess you didn't read the part about wanting to use the 3-way slider instead of a push/pull? You'll catch more flies with honey than vinegar. Looks like you posted this thread on the 26th, and you're complaining on the 27th that you don't have the answer you want. The reality is that you can't get what you want with the setup you want to use, the way you want it done. It will take a bit of work to come up with a possible solution. give us a break and a chance to figure this thing out. PS: looks like Brian answered. I did read the post. I didn't think what he originally wanted could be done in the way described. A slider and mini toggle use the same diagram and adding the push pull makes more sense to me. I was making a suggestion of what I know works to get the options he wants, plus a couple more. If he doesn't want to use it fine. BriGuy came up with what the op wants I think. Suggested the mini toggle in pic because I like the look and ease of use. 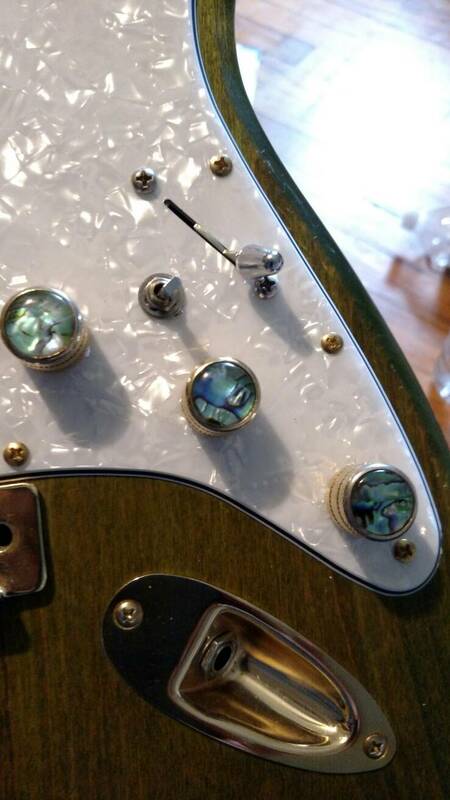 Sliders look great on Jazzmaster and Jaguar. Not so much on Strats. But that's just uh, my opinion man. Thanks for putting me on point to emphasize these things at the beginning of my responses in future threads though GuitarDoc. Really appreciate everyone's efforts of this.. I did start the same thread in the 'Guitar' section prior to posting here, and a similar thread prior to this one in the 'Pickup' section of the forum without too much response. Also I was led to believe the setup I wanted could be achieved using only a 3-way switch, but as I admitted previously I'm inexperienced on this subject and I also apologised for my salty (and vinegary) response. I just want to play guitar rather than be constantly dismantling it. Had this thing for 20 years without changing anything but strings. Makes me a little nervous going in there and snipping out wires tbh..!! I was trying to avoid using a push-pull switch and haven't the expertise to alter any diagrams to fit my needs just yet so I really needed something quite specific before I would attempt any physical changes to the guitar. I was contemplating using guitarelectronics.com once I learned about them on this thread. Maybe undeservedly, but fortunately for me, BriGuy1968 came up trumps with a superlative diagram and I can't wait to build and test it and for others to be able to use too. Thanks again for this BriGuy. Also thanks to thebingopete for his post and very usable diagram. Last edited by de_dUKe; 04-29-2017 at 12:36 PM. I received a PM from Teleplayer who pointed out an error in the diagram I gave you (Nice catch, Teleplayer ). Unfortunately, the 3-way slider won't work. In it's present setup you won't have any sound in the "Down" position (HSS Mode)... and I can't see a way to remedy it. The only way I can see to make it work with a single switch is to use a 4-way On/On/On 4PDT like this one, so here is an addendum to my previous diagram. Alternatively, it could be done with two 2-way sliders, 2 SPDT (or DPDT) mini switches, or a combination of the two types. If you're interested in that, it would give you separate switches for changing the guitar from center (in position 3) to bridge & neck and for splitting the bridge. Advantage: split bridge could be available in either mode. Disadvantages: two holes instead of one, and two movements instead of one (potentially). I'm moving today and I'm sure I won't have time to completely update the diagram for a few days, but I'll get to it. Let me know if whether to do it with the single 4PDT or with two switches. Sorry about the mistake, and thanks again to Teleplayer for the great catch! The thing about push pull pots is that they don't alter the appearance. That's why I posted pic of the controls of mine. To show that you can only see the mini toggle added. Which by the way is easier to install as it's a small drill hole not a square/rectangle that can end up looking like a hack job if you're not careful. If I dig harder I can probably find a single diagram of my setup. It will give you all the combinations you want. Just not how you were hoping for. But very functional. The push pull pot turns my bridge pup on full-time for use with neck and/or middle pups. The mini toggle not only splits the HB coil, gives series parallel options too. And that covers the options you want plus adding the parallel HB option. If you were to try it you'd get why I recommend this as I do. The wiring isn't as complicated as 2 diagrams make it appear. Let me know if you want me to dig and let Brian off the hook. Wowsers, there has been some major developments on this subject and it's not quite over yet.!! This really was a tough ask wasn't it..?! I didn't realise the hassle it would cause. Sorry dudes.. I already have the 3-way switch so I would like to use that. What else could be done by adding a push-pull.? Could we add the coil split and neck/ bridge combo using these.? I guess I'd be happy to follow bingopete's diagram as it adds all the functionality I require. So the 5-way Super switch wouldn't be need and can be cancelled.? If so I'm saving monies at least.! Good spot by Teleplayer and thanks for everyone who has posted to update the thread in time. I'll follow the route of less resistance on this one to get the job done. Plus time isnt a factor as it's a long bank holiday weekend here so any more parts cannot be purchased for a few days. BriGuy is a busy man atm and I wouldn't want him to spend any more time and energy on this. Best wishes and good luck with the move..
Last edited by de_dUKe; 04-30-2017 at 11:35 AM. Use the 3way for splitting the HB. There's a few ways that can be done. Either N/HB/S. N/parallel/series. S/parallel/series. The N/HB/S would be a good choice as you can be sure to be in phase with the other coils when splitting. Or out of phase if you so choose. A whole different set of tonal variety. Could be quite useful.